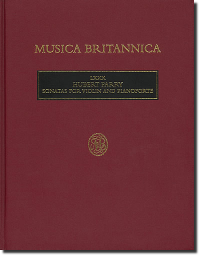 A key figure in the so-called English Musical Renaissance, Parry was a considerable composer of chamber music. His three violin sonatas, the first of which, in d minor, is here published for the first time, along with the Fantasie-sonata and Sonata in D major, date from the 1870s and 80s, and are contemporary with his four symphonies and setting of Milton's Blest Pair of Sirens . They are fine additions to the string repertoire and will be greeted enthusiastically by violinists seeking new material for recitals. Performing editions of each sonata are available separately.